I FIRST came into contact with these execution photos in a shocking manner. In my High School public speaking class in 1989 when I was eighteen I enjoyed discussing my interest in the military history book "Panzer Battles" by Mellenthin with my Polish West German friend Philip Kurkowski. I did not know much about the Nazis at that time in my life other than leafing through my father's copy of Albert Speer's book. A Jewish girl named Suzanne Wunder took offense. She got a book from the school library and without a word opened the page with the terrible execution photos and shoved the book in my face. I tried to look away because I was young and innocent minded and felt threatened. I was also scared when Suzanne accused me right there of being a "Nazi" because in her words I had "blonde hair". I feared retribution from other male students in Suzanne's tow. I was disturbed and tried to defend myself and mumbled "That's communist propaganda -- and you're the Nazi, not me". She just laughed and seemed satisfied with the shock effect she had achieved. I wish I had the presence of mind to reply in the manner you did to Steve Cass. I am thankful for your posting all of the Minsk photos and grateful for your statements regarding them. It helped clear up an unjust guilt complex I had developed from this episode and had harbored for over fifteen years. I HAVE however received some hate mail about my comments from incorrigibles, who did not get the point of my reply to Cass. I was taken aback to see that the execution photos of the girl and her friends were already at several places on the Internet (identifying her as Jewish. She may or may not have been). What impressed me was the calmness in her face. I am puzzled as to how the prints came out before the family gave the negatives to me. The Generalkommissar Wilhelm Kube must have made the negatives available in 1941 for publication. They are identical in every respect. I had the original negatives in my hands until yesterday when I returned them to [...]. Have a look at the whole series I have just posted, a representative cross section of the 171 negatives. 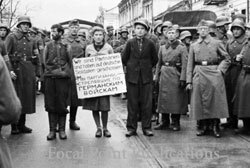 I am hoping the family will dig out more for me, particularly Heinrich Himmler's visit to Minsk on August 17, 1941.